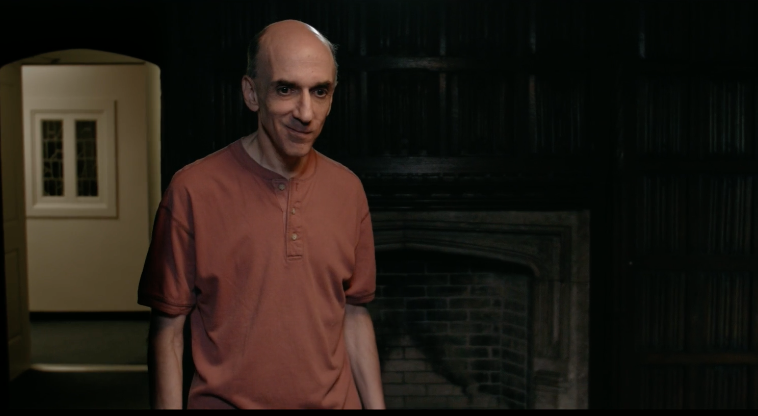 Steve Platt has the lead role in "The Museum of Lost Things," a film based on a short story by LIU Professor Dennis Pahl. For several days after its first screening at the recent Long Island International Film Expo in Bellmore, the buzz was building about “The Museum of Lost Things,” the 22-minute movie based on an original short story by LIU Professor of English Dennis Pahl and directed by Gregory Cioffi (Post ’13, M.A. Theatre; ’11, M.S. Adolescence Ed; ’09, B.S. Childhood Education). Then at an awards ceremony held on July 13, it won the prize for Best Story, topping a field crowded with both feature-length and short movie entries. Now it’s on to the Madrid Film Festival, where the film is nominated for Best Short Comedy and Best Supporting Actor. “Let us thank a great director, a terrific cast and crew, and a talented cinematographer and editor at The Majors Productions for bringing to life the original story on which the movie is based,” said Dr. Pahl, in a statement he posted on Kickstarter, where more than $7,000 had been raised to help fund the project. He also singled out for praise his wife Luda Pahl, who served as costume and set designer. 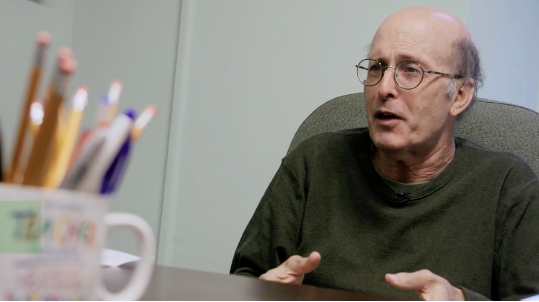 Dr. Dennis Pahl, professor of English at LIU Post, discussing the creative connections that helped turn his prose into film. In Dr. Pahl’s original story, an aging New York writer stumbles across a museum he’s never noticed before. Once he enters, he discovers that everything on display contains connections to his past. Other Post alumni who helped bring this story to life are Rob LaRosa (Post ’12, B.F.A. Film), who did the editing, and Sheere V. Campbell (Post ’14, M.A. Theatre; ’11, B.S. English), who plays The Jamaican Woman. Besides his other cinematic duties, Cioffi portrayed The Husband. Actor Steve Platt, who bears an uncanny resemblance to Dr. Pahl, stars as The Museum Visitor. Several settings for the film, which is a production of Mishigas Film in association with G&E Productions and The Majors Productions, will be familiar to Post students and alumni since scenes were shot at Winnick House, the Great Hall, the Hunt Room, the Pratt Center and the B. Davis Schwartz Memorial Library, where a winding stairway that leads to wall instead of a door is more than a metaphor. The genesis of the film goes back to the creative relationship Cioffi maintained with his professor, Dr. Pahl, after he graduated with his degrees. And so “The Museum of Lost Things” took off, and the result is now a film that is beginning to find a wider audience by the day.